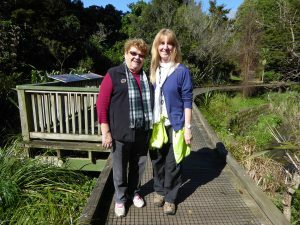 With renewed awareness about the issues of urban stormwater in Auckland STEPS has been busy walking people through Roy Clements Treeway and Kerr Taylor Reserve. Here Pat Prescott and Councillor Cathy Casey are shown walking along the boardwalk. We were delighted with the diligent follow up from Councillor Casey and council officers about some of the improvements that need to be made. Councillor Casey later followed up with a question to the Healthy Waters team (Auckland Council) about multi lingual signs pointing out the dangers of beaches and creeks subject to overflows of sewage and heavy metals. STEPS is very concerned about non-English speakers who collect and wash wild green vegetables in Meola Creek. We thank Councillor Casey, along with others who are asking about STEPS’ work and the state of Meola Creek in 2017.